Today is Easter Sunday in the world of the believers – and that’s a pretty large percentage of the population. 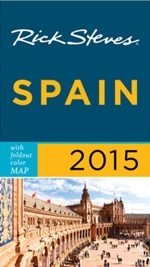 It also marks the last day of the week long Holy Week festival of Semana Santa in Madrid and throughout Spain. Some years I’ll write about Madrid’s Semana Santa processions before they happen, but that’s all pre-procession-projectory. This year I decided to wait until the end to do a general summing up. In short, nearly half of the planned processions never made it out their respective church doors due to rain. The other half marched with at least some risk of rain during their (sometimes) 2+ hour processions. María Santísima de los Siete Dolores on Friday, 29 March, from the Parroquia de la Santa Cruz – for which I was selected as one of the official PRESS photographers. Wednesday’s 8:30pm procession of Nuestro Padre Jesús de la Salud “Los Gitanos” was my first of the year. The weather was quite pleasant for this Holy Week procession in Madrid. I first went to the Church on the Calle del Carmen at 8pm, but couldn’t even get close. The streets were packed with those awaiting the exit of the “paso” (or “float”). I darted down to the Puerta del Sol, where I knew it would pass, and positioned myself on the “front line” of the street’s shoulder immediately in front of -and facing – the door of the Real Casa de Correos (with the clock tower) of the Puerta del Sol. This procession portrays “pasos” of Jesus Christ carrying his cross and surrounded by purple flowers. Later came the Virgin Mary. And I was perfectly positioned to witness it all up-close and personal. And BOY was I perfectly positioned! Just before the procession reached me and the Real Casa de Correos, the masses to my right were moved to allow the procession’s path to return semi-directly to the church by first going up the Calle de Preciados due to a forecast of rain sometime between 10:30pm and 11:00pm – as I overhead the procession leader tell someone to my right. This positioned me perfectly in the elbow of the procession path so I saw them coming and going, turning the corner at my shoulder. The float of Jesus Christ passed me at 9:30pm and the Virgin Mary passed me at 10pm. Thursday’s two attended processions were to both pass through the Plaza de la Villa so that’s where I awaited them. Unfortunately, I arrived a bit late, 7:30pm, to get any good position for the Nuestro Padre Jesús Nazareno “El Pobre” y María Santísima del Dulce Nombre procession which left the church at 7pm. The plaza was already nearly full from bottom to top so I wedged myself in towards the top. The wind was whipping and rather cold under clear skies, but the inactivity of the wait made me even colder and my feet hurt more. Leading the procession, the horsemen entered the Plaza de la Villa at 8:20pm, but the float of Jesus Christ didn’t arrive until 9:18pm and the Virgin Mary at 9:40pm, both stopped to rest below a balcony-full of dressed-up politicians or government workers before leaving the plaza up the Calle Mayor to then passing through the Plaza Mayor. Seeing the entrance into the Plaza de la Villa of the first pointy-hooded “Nazarenos” of the second procession, I decided to “race ahead” of the first one, Nuestro Padre Jesús Nazareno “El Pobre” y María Santísima del Dulce Nombre, to meet it in the Plaza Mayor for additionally scenic photo backdrops. Unfortunately, I never made it. The streets were totally blocked so I wound back and found myself blocked again by the second procession, the one for La Macarena, formally known as Nuestro Padre Jesús del Gran Poder y María Santísima de la Esperanza Macarena. Arriving “late” for this one, I’d missed the float for Jesus Christ and just caught the Virgin “La Macarena” passing in front of the San Miguel Church where I had a good view with lots of space among the crowd. After it passed, I was able to run ahead and catch it before she turned up towards the Plaza de la Villa and out of sight. Good Friday, 29 March, it rained all morning, nearly all afternoon long, and I was certain all 3 of the processions would be canceled. In fact, both of the 7pm processions were canceled because it was still raining. The one I planned to attend at 7:30pm, María Santísima de los Siete Dolores from the Parroquia de la Santa Cruz, was still scheduled to go on. I’d arrived at the Parroquia de la Santa Cruz, (big red brick tower very near the Plaza Mayor) Calle de Atocha, 6, at 6:45pm and it had stopped raining briefly, only to start raining again at 7pm, 30-minutes before the scheduled 7:30pm start of the procession through the streets of Madrid. It was delayed. BackStory: A few months earlier I was selected to be one of the 3 official photographers for this important procession after the church saw my video of their procession from 2012, passing through the Plaza Mayor. It was a true honor. The Press Pass gave me full access to everything, a true privilege which I took very seriously. With this honor, and the press pass clipped to my shirt, I walked among those preparing the floats, poking around and behind the floats within the Parroquia de la Santa Cruz. It also allowed me to get very up close to watch the faithful kiss the plaque of the “Heart of Jesus” as well as kiss the feet of the image of Jesus Christ, each of which was carefully wiped with a white cloth after contact. It gave me a rarely-seen perspective as I constantly walked among those participating in the procession, front to back, side to side, beginning to end, never stopping to take photos and video, all this as the crowds crowded pushed to get a glimpse of María Santísima de los Siete Dolores along the path. At 9pm, the procession finally left the Parroquia de la Santa Cruz, carefully and excruciatingly lowering the Virgin below the door frame and out to the momentarily clear skies outdoors. We passed through the Plaza de la Provincia, through the Plaza de la Puerta Cerrada and up the Calle de Cuchilleros, over to the Plaza Conde de Barajas, winding through the narrow streets of Madrid de los Austrias and into the wide-open Plaza de la Villa at 10pm, where surprisingly few people were waiting after the hour and a half delay. From here we entered the Calle Mayor and passed under the arch of the Calle de Ciudad Rodrigo to the Plaza Mayor at 10:30pm and exited the other side via Calle de Gerona to the Plaza de la Provincia and back again to the Parroquia de la Santa Cruz at 11pm. Right at the end of the procession it started to sprinkle just a bit. Some might argue that, by some miracle, the clouds parted just long enough. 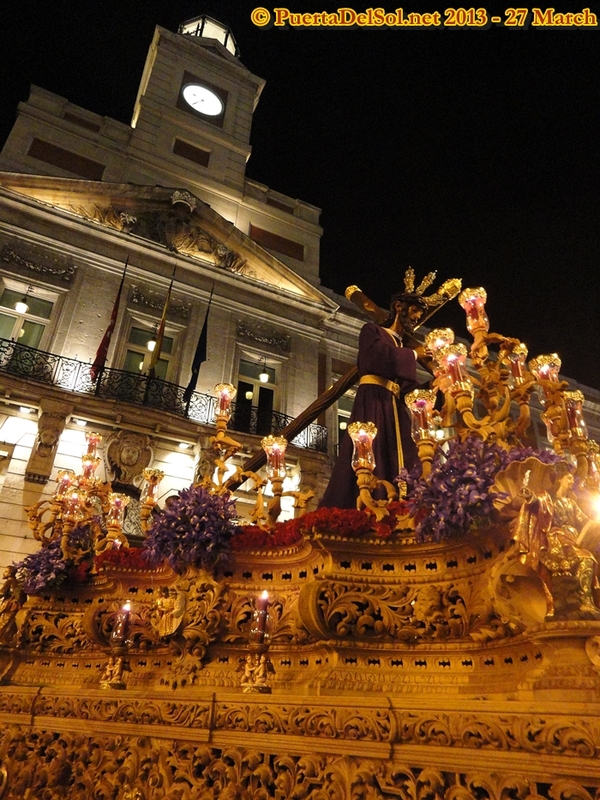 It was another wonderful, albeit weather-filled Semana Santa in Madrid. These processions are always an emotional spectacle even if you’re not religious. The tradition, the music and artisan sculptures alone make them worth the wait. This entry was posted in About Spain and tagged 2013, Holy Week, Jesus, jesus christ, la macarena, Madrid, maria, Maria Santisima de los Siete Dolores, pasos, Plaza de la Villa, plaza mayor, procesiones, Procession, procession route, Puerta del Sol, Semana Santa, Siete Dolores, virgen, virgin, Virgin Mary. Bookmark the permalink. I am a solid catholic too. We celebrate holy week, lots of prayers, pasting, no trips. We just stay home in observance of the holy season. 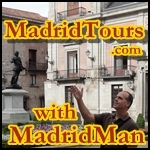 Madrid is a great place to stay for this summer. Next on Holy Week, during the months of May, you can participate in the San Isidro feast or the La Paloma feast in Agust. I’m neither catholic nor religious, but I do appreciate the history, tradition, and theater which takes place during Holy Week and other holidays in Spain. Plus, I know it’s a interesting curiosity to those from other cultures.